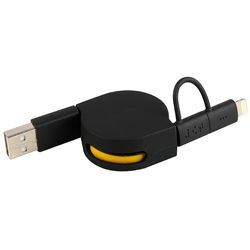 The retractable combo cable is a 2-in-1 solution for charging devices with Lightning® or Micro-USB ports. The cable retracts by simply pulling on both ends so you can easily store it in your pocket, purse or backpack. EXTENDS UP TO 2 FEET - Connect your devices up to 24 inches away, with an easy to use retractable case all housed in a durable plastic shell. RETRACTABLE FOR EASY STORAGE - This unique flat cable design prevents tangles, and the retractable design allows you to use only the length you need, reducing clutter. CONNECT iOS AND ANDROID DEVICES - With a Micro-USB plug and a Lightning-enabled connector you can connect any two compatible devices to charge and sync across platforms.